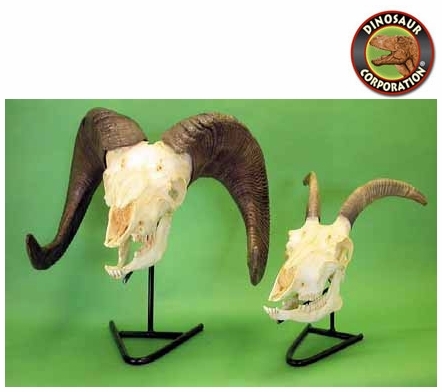 Desert Bighorn Sheep Skull. Male. Ovis canadensis nelsoni. Western United States desert. (shown on the left) Polyurethane cast of an original California Academy of Sciences specimen. The Desert Bighorn Sheep (Ovis canadensis nelsoni) is a subspecies of bighorn sheep found in the desert Southwest United States and the northern regions of Mexico. Desert Bighorn Sheep are stocky, heavy-bodied sheep, similar in size to mule deer. Weights of mature rams range from 115 to 280 pounds (55 to 90 kg), while ewes are somewhat smaller. Due to their unique concave elastic hooves bighorn are able to climb the steep, rocky terrain of the desert mountains with speed and agility.